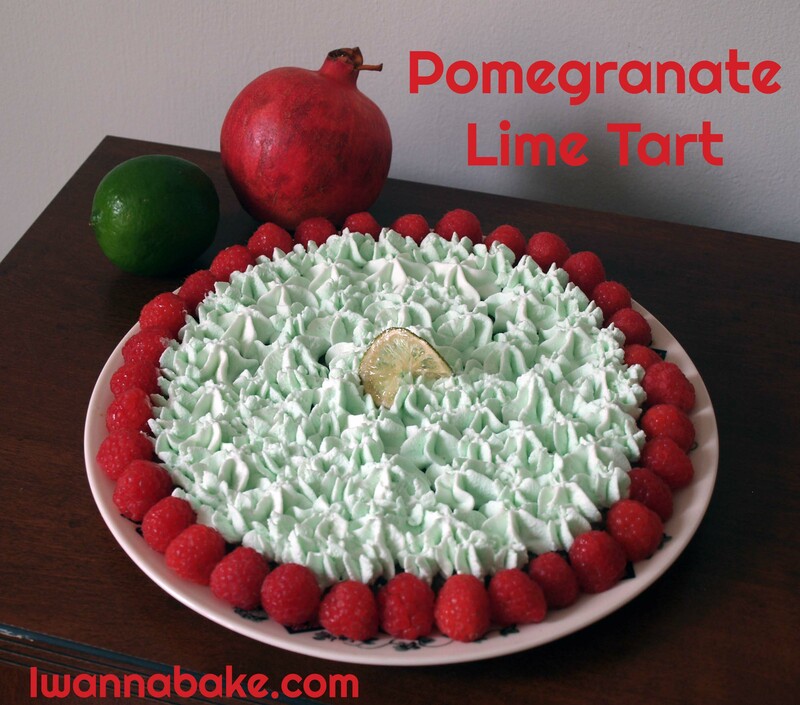 Pomegranate Lime Tart | I Wanna Bake! As I often find myself doing, I adapted this recipe from Joy of Cooking‘s Lemon Tart recipe. 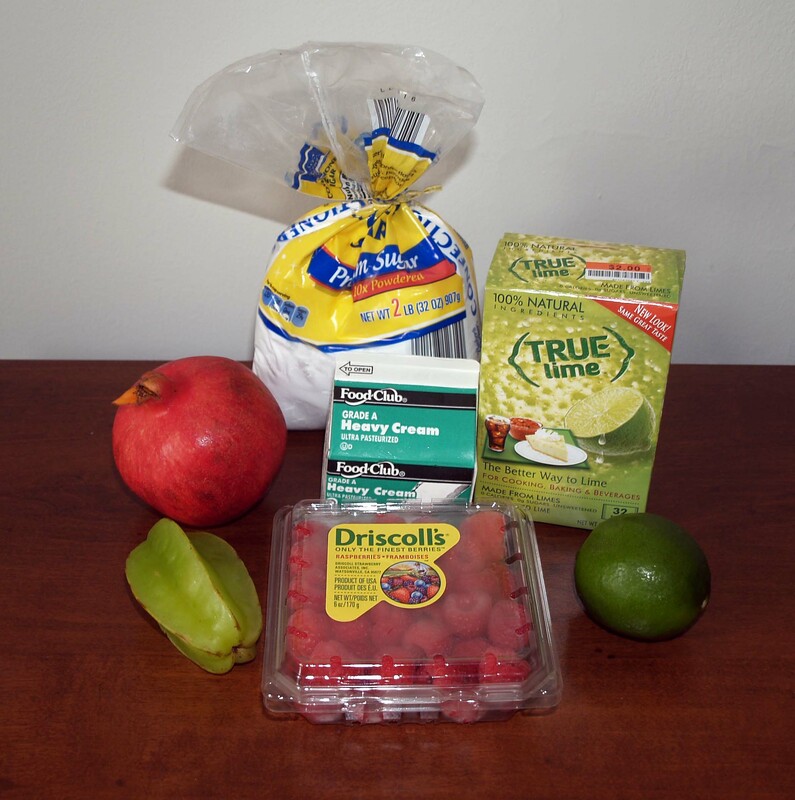 In this instance, I substituted limes for lemons and used a 50/50 mix of fresh lime juice and pomegranate juice for the liquid. I found that it was easiest to prepare all of my ingredients ahead of time as if I were on a cooking show. 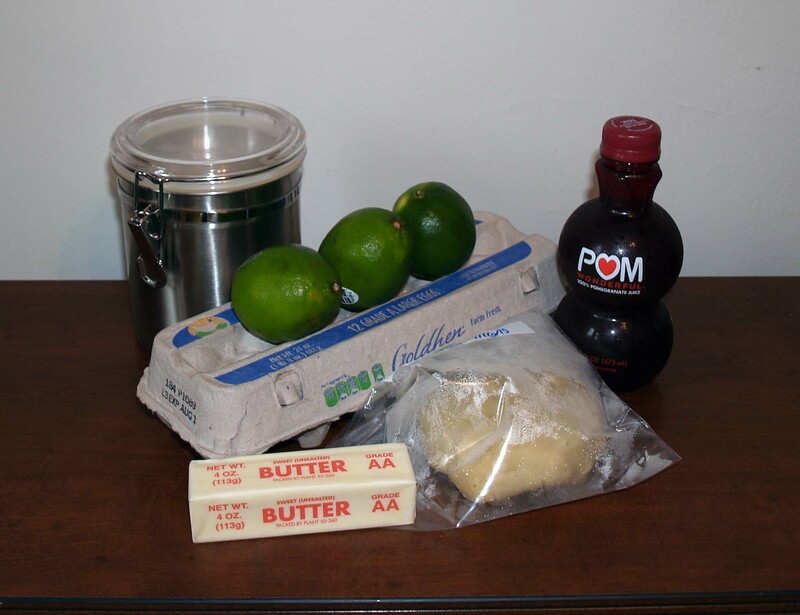 That way, my filling didn’t have to sit and wait on the counter while I separated eggs and zested and juiced limes. 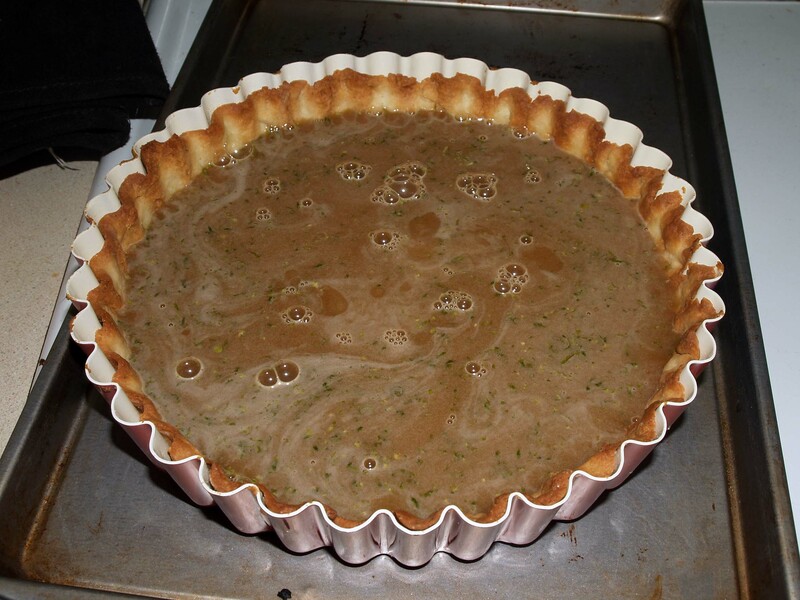 As you will soon see, there was a bit of a mishap with this tart (read: it turned out fugly). Unlike in last week’s case, I had some added motivation to make it work. Funny how needing to bring something to a party in a few hours can force you to be creative with your decorating. Hopefully this serves as an example of what you can do with an ugly dessert, some whipped cream, and some fruit. With all the classic rock I’ve been baking to lately, I decided it was time for a change of pace. I chose some jazz a la Charles Mingus, one of the greatest jazz bassists of all time. If you haven’t heard of him (and if you’re into jazz), I recommend checking out one of his many records. 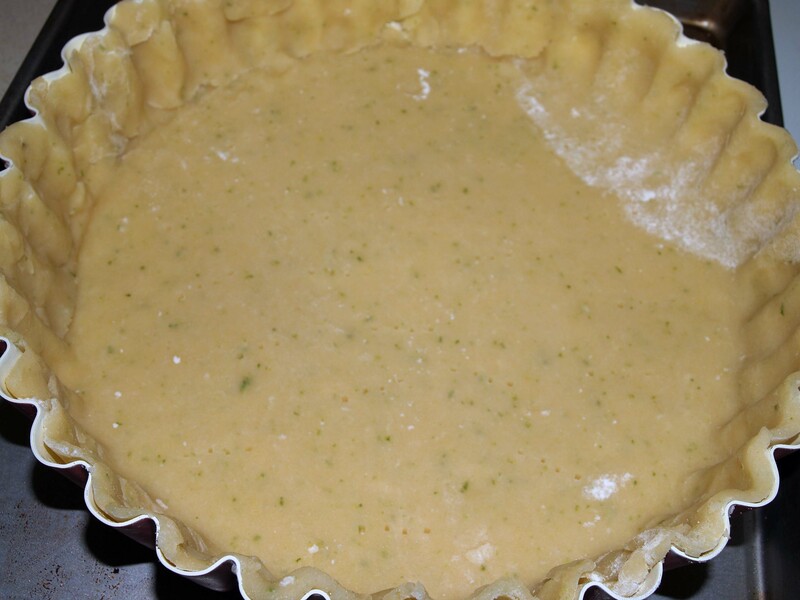 Prepare and refrigerate your pie crust if you’re making it from scratch (see here for the recipe I use). I added the zest of one lime to a full batch of crust, then froze the half of it I wasn’t using. Roll out your pie crust and fit it into a 9″ tart pan, trimming the crust flush with the edge of the pan. As you can see, mine broke in transit, so I patched it. This turned out to be a huge mistake because the filling leaked out of the crack while baking and stuck to the edge of the tart pan. When in doubt, re-roll it out. Prick the bottom of the crust all over with a fork, line it with aluminum foil, and weigh it down with pie plates or a 9″ round cake pan that fits snugly inside. 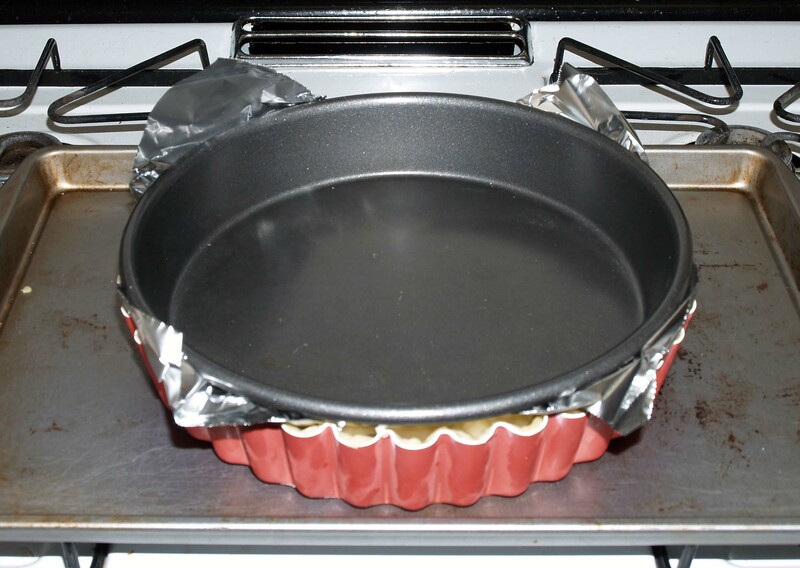 Bake the crust for 15 minutes, then remove the cake pan and foil and bake for another 5-10 minutes. The edges should be somewhat browned. Remove from the oven and set aside. Reduce the oven temperature to 350°F. Now prepare the filling. 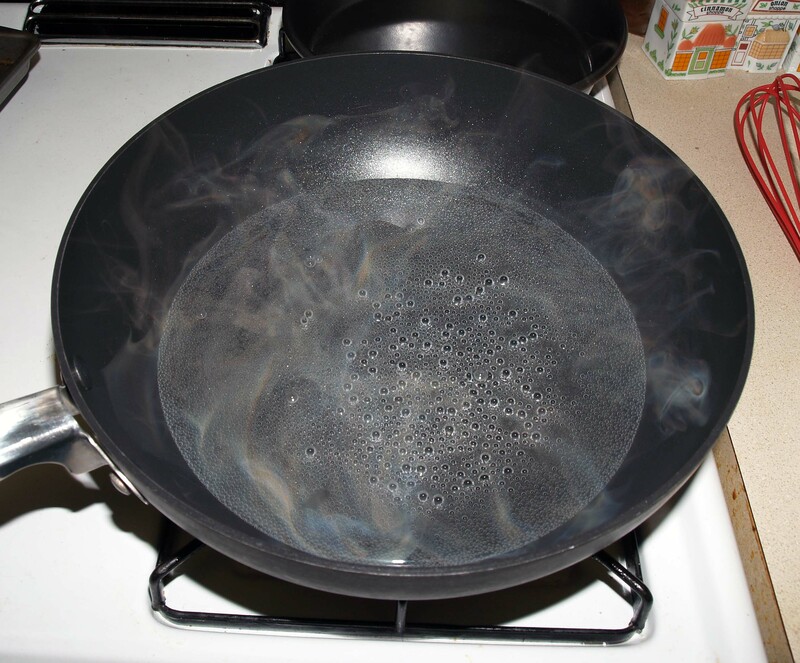 Fill a large frying pan with 1″ of water and bring it just to a simmer. 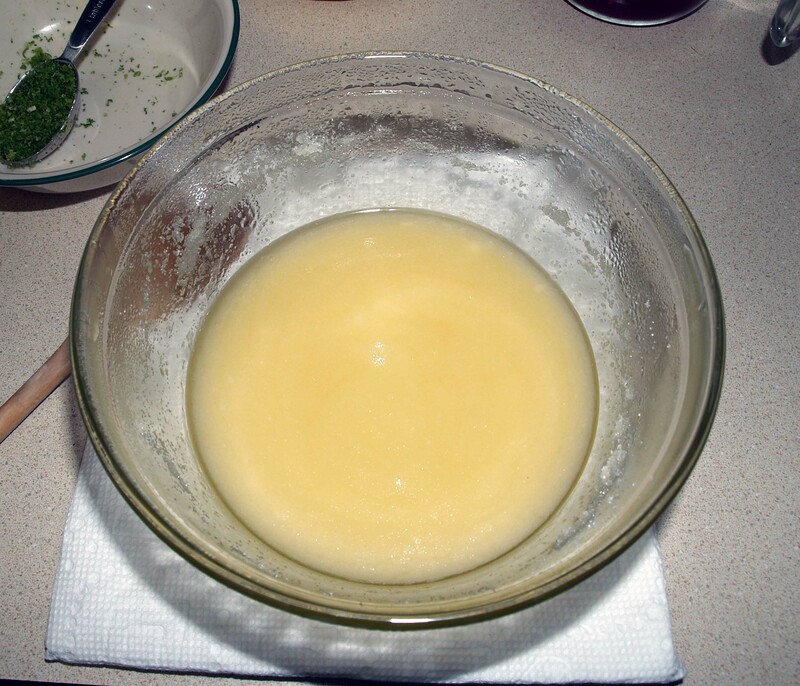 In a medium, heat-proof bowl, stir together the sugar and butter cubes. 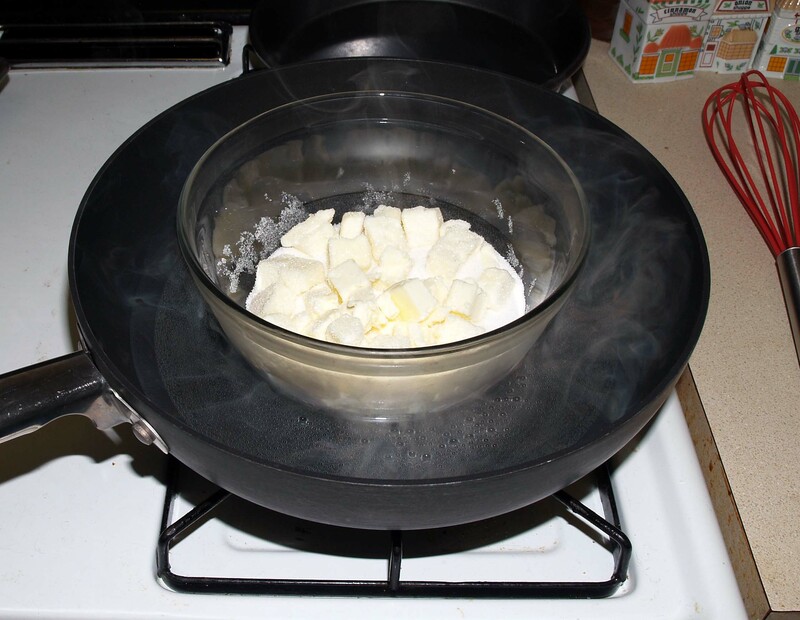 Place the bowl in the simmering water and stir the sugar and butter until the butter melts completely. Remove the bowl from the water (CAREFULLY!) 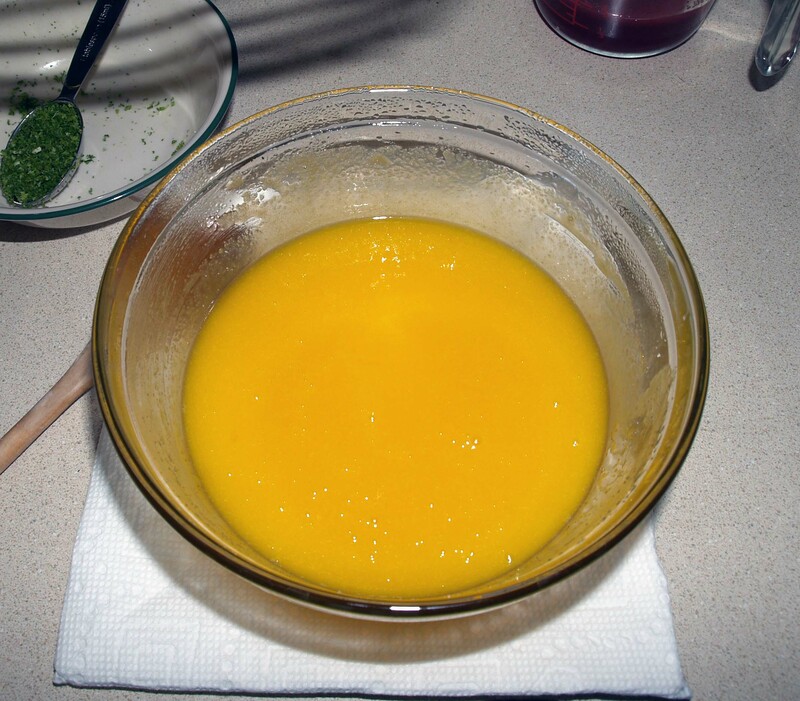 and whisk in the egg yolks until they are fully-incorporated. 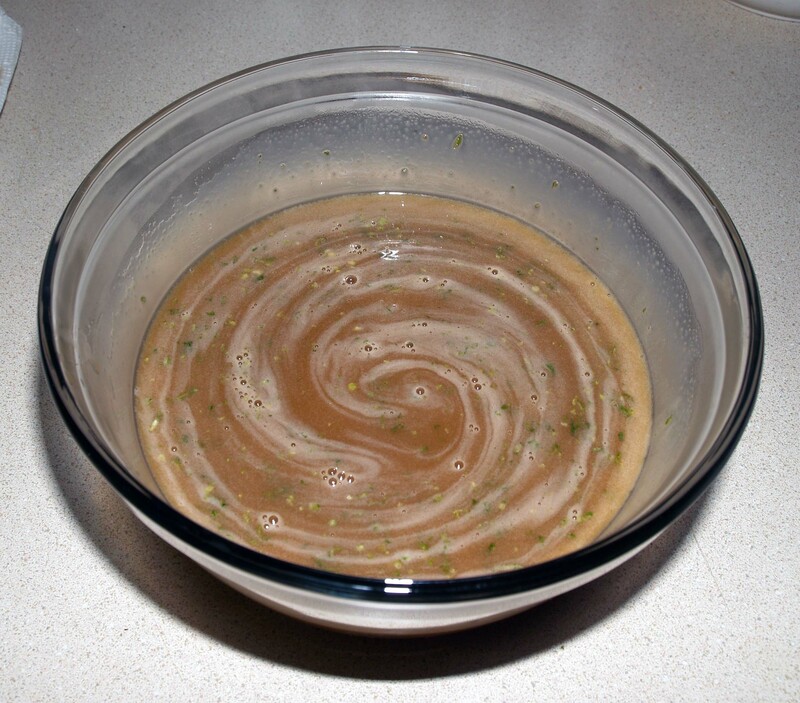 Whisk in the pomegranate and lime juices and return the bowl to the simmering water. 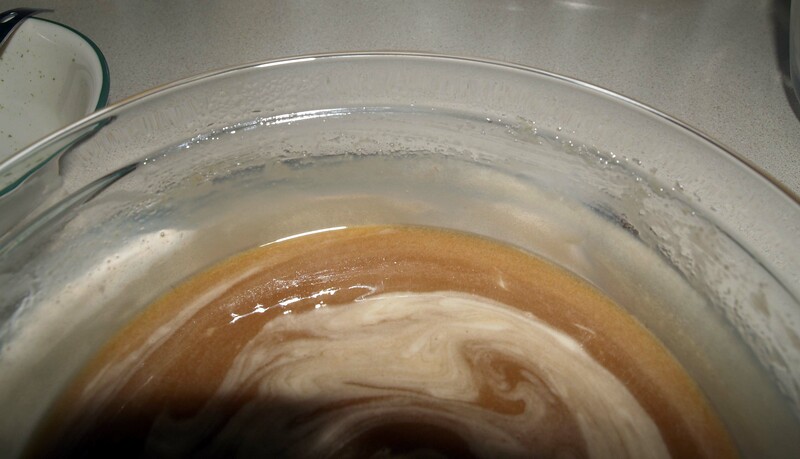 Continue to whisk the mixture slowly, occasionally scraping the sides of the bowl, until it thickens and sticks to the side of the bowl when you swirl it. Remove the bowl from the water and whisk in the lime zest. 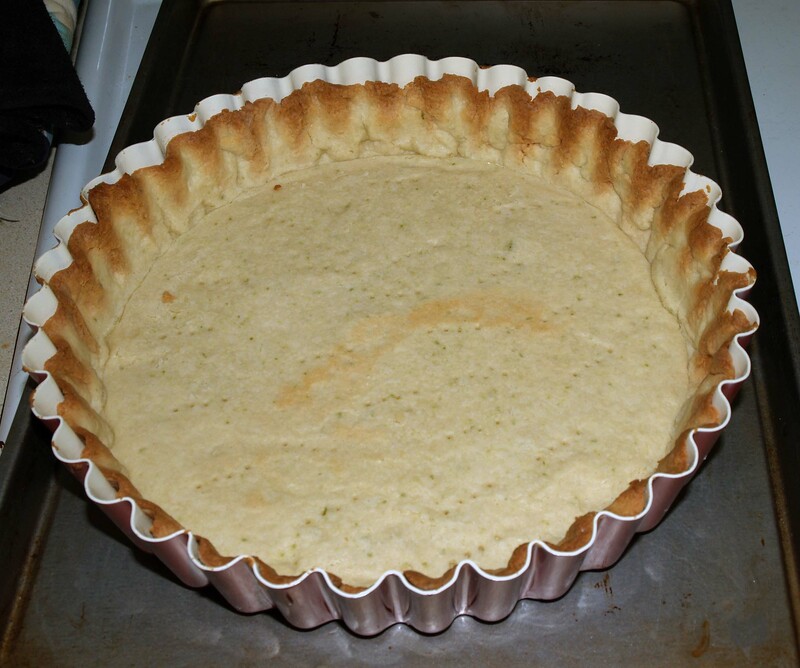 Carefully pour the filling into the prepared crust and bake for 25 minutes, or until the center looks set when you shake the pan. Leave the tart to cool completely on a cooling rack. If you need to take it somewhere the same day like I did, you can refrigerate it after about an hour of cooling. Don’t remove the edge of your tart pan until the tart is fully-cooled. Now, let’s talk decorations. 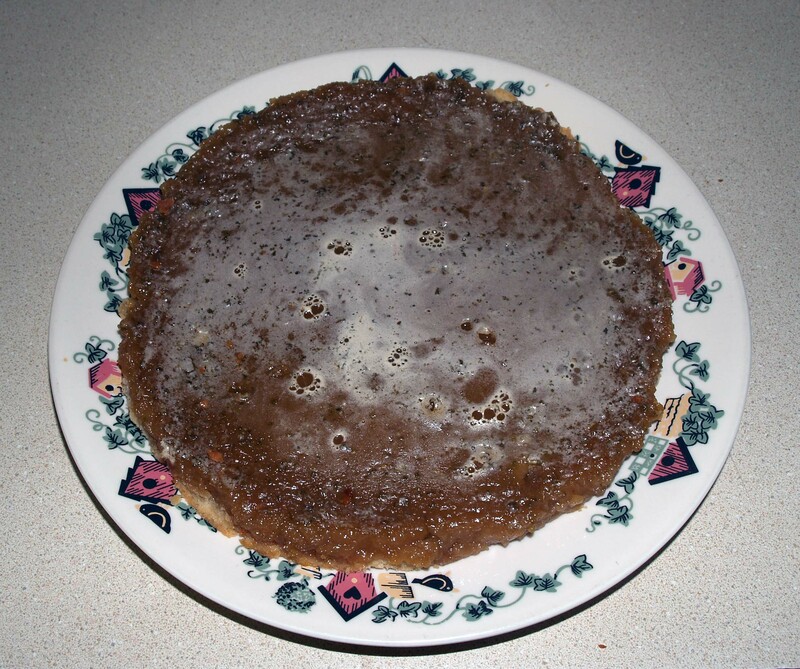 As mentioned above, my filling leaked out of my crust and stuck to the pan. Unfortunately, when I tried to separate the edge of the pan, it ripped off most of the edge of the crust. This is a dessert that only a mother could love, and as its mother, I had a really hard time loving it. But don’t despair! There is still hope if you find yourself with a pastry disaster. To put some lipstick on this pig, I decided to add some lime-flavored whipped cream, a border of raspberries, and a candied lime slice in the middle (though the candied lime was always part of the plan). I also had a pomegranate and a star fruit on standby, but chose not to use those because a) I didn’t want it to look too busy, and b) I didn’t have the time to seed a pomegranate before the barbecue. 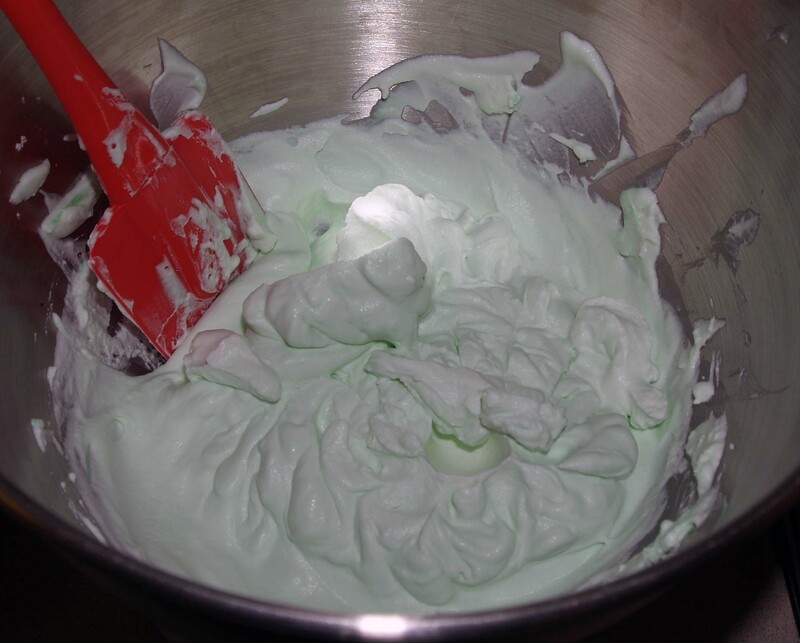 To make the whipped cream, chill a stand mixer bowl or other mixing bowl and your beater(s) or whisk. Pour 8 ounces of cold whipping cream into the bowl and mix, starting on low speed and increasing to medium as it thickens, until the cream starts to hold soft peaks. At this point, add in the powdered sugar and crystallized lime packets. Whip the cream until it is the desired consistency. If you’d like, you can stir in some green food coloring at this point. Load your whipped cream into a pastry bag or gallon-sized, resealable plastic bag fitted with a large star pastry tip (if you don’t have one, you can just snip a 1/2″ hole in the corner of the bag). Pipe stars in concentric circles, starting at the outer edge and working your way in. Fill in any gaps with smaller stars. If you’re not into piping, you can also spread the whipped cream over the top of the tart with a spatula. If you go this route, I suggest adding some extra decorative fruit, such as star fruit slices or more candied lime slices, to pretty it up a bit. To finish it off (and hide the glaring lack of edge crust), I added a border of fresh raspberries. 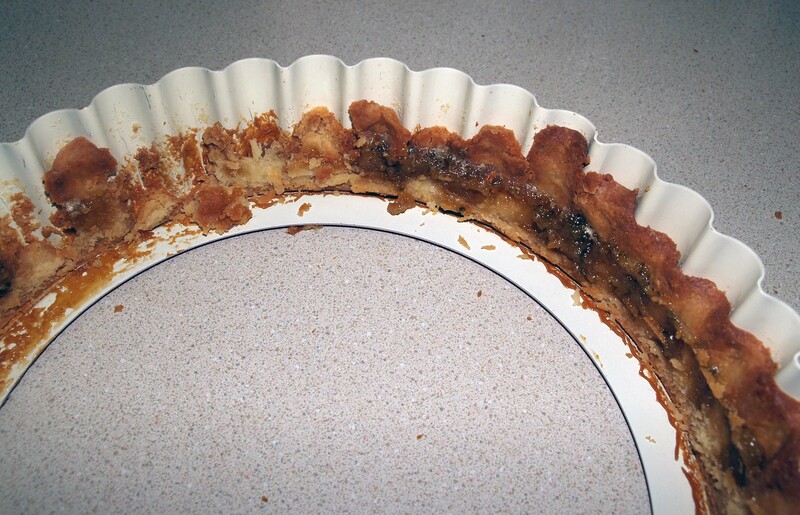 This may seem obvious, but I feel compelled to note that you should definitely remove your tart from the bottom of the tart pan and transfer it to the plate you plan to serve it on before you do this (for obvious reasons). Add a candied lime slice (or other fruit) in the center, and you’re done! Crisis averted! Now revel in the ooos and aaaahs you’ll receive once everyone tries a slice of your deliciously rich pomegranate lime tart! 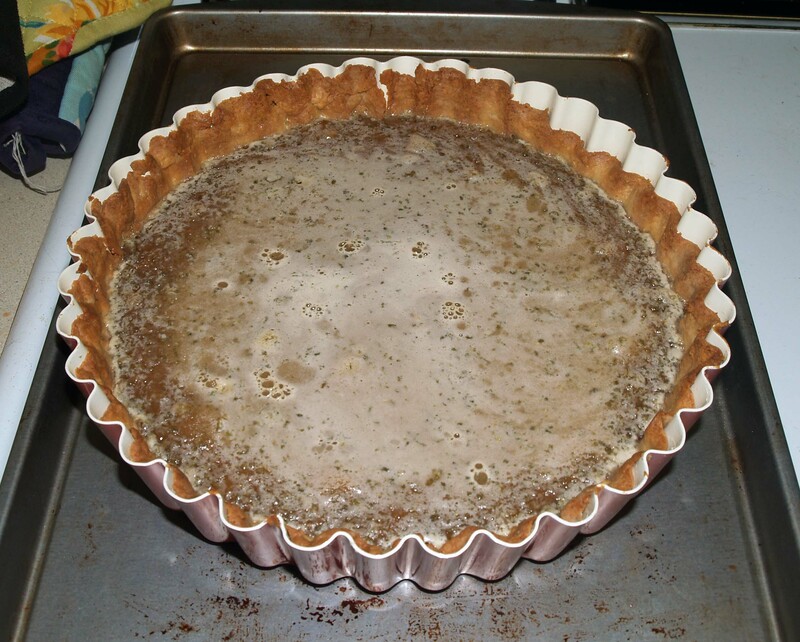 Pingback: Cinnamon Tart | I Wanna Bake!